Deutsche Bank just warned that it anticipates a multi-billion dollar bust. Germany's largest bank reported that it will take a nearly $7 billion loss in its third quarter for a write down related to its corporate banking unit. The news was reported after U.S. markets closed Wednesday, and Deutsche Bank's (DB) stock immediately fell 6% in after-hours trading. In Germany, shares took a dive on Thursday morning but then swung into positive territory. Due to the expected loss, Deutsche Bank's board will recommend "a reduction or possible elimination" of the stock's dividend, according to the statement. Its dividend is currently 83 cents a share. That could deter potential investors or cause current ones to sell the stock. The warning stems from at least two charges and a company decision to put aside cash to fight potential legal battles. Those losses will eat into any profits the company might make in its third quarter. The bank said the core of the anticipated loss -- $6.5 billion -- is due to higher regulatory requirements to have more cash and the cost to get rid of its former subsidiary, Postbank. It's also taking a $673 million write down in its stake of a Chinese bank, Hua Xia. 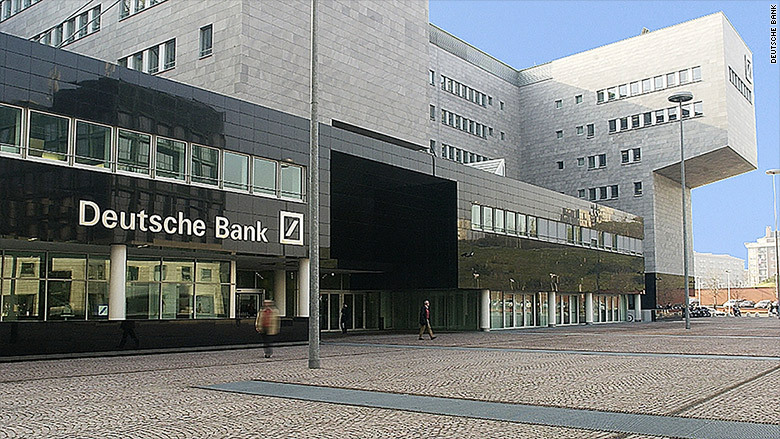 Deutsche Bank owns nearly 20% of Hua Xia, which is headquartered in Beijing. Lastly, it's holding $1.3 billion aside for anticipated litigation battles. Factoring in the bank's profits, the loss is expected to total $7 billion. Over the last 12 months, Deutsche Bank's stock is down about 14%. That's worse than some of its competitors. Barclays is up 11% over that time period, while JP Morgan (JPM) and BNP Paribas are both up too.